You have the travel bug and you want to figure out a way to travel longer than a week or two each year. You want to travel, but you don't have the funds. You love travel and want to turn it into a lifestyle. You're in school, have a job you love, but you want to travel more. You're at a point in your life where you looking for a change. If any of the above sounds like you, you're really going to like this post. Here are 20 Ways to Travel Longer (and some of them will even pay you to travel). 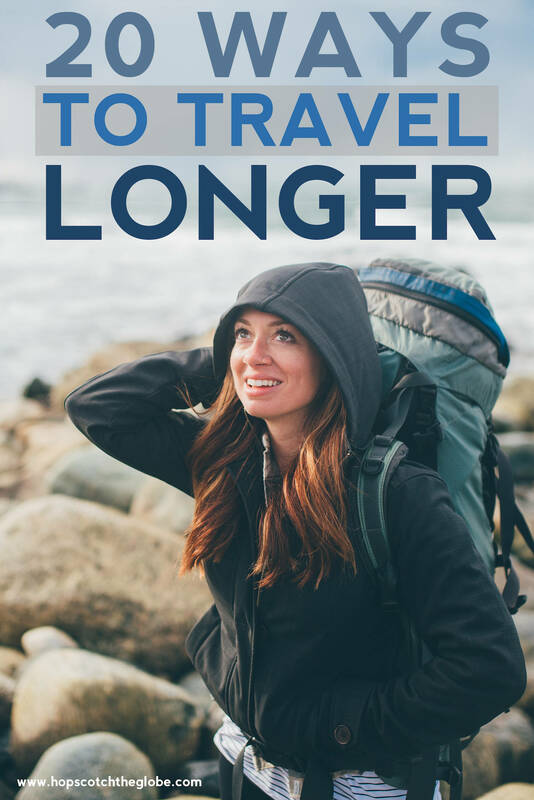 Click play on the video below to discover 20 Ways to Travel Longer and keep scrolling down on this post for more information and links to awesome resources. With study abroad programs, you can learn and get a cultural experience. During my last semester of high school, I spent 4 months living and teaching in Paraguay, South America with an organization called AFS Intercultural exchange while earning school credits. This experience is what has made me the person I am today. My experience in Paraguay sparked my desire to keep travelling, led to me receiving a $30,000 scholarship to college, shooting my first documentary in Peru, strengthening by bond with my boyfriend at the time (who's now my husband), helped me get every single job I've ever had, allowed me to develop lifelong friendship, and focus my entire career around having more incredible worldly experience by starting this blog you are reading. If you’re already in university, check with your institution about study abroad programs they offer. These courses/programs can range from a couple of weeks to a year or more. Plan side trips - if you’re studying in Manchester, plan a trip to London, Paris, Prague, or wherever you want to go on weekends or vacation time. Explore the area you’re staying in - don’t *just* go to class. Get involved with clubs and extra curricular activities to become part of the community you're in. Learn about the country you’re going to before you go. This will help you understand and adapt quicker. Plus if you're in a country where they speak a different language, it's a good ideas to start learning some words and phrases before your trip. At some point, you’ll settle into just living there and not feel like a tourist. Don't let this stop you from exploring as if you were a tourist. Soak it all in! It’s common for travellers to try to see as much as they can in little time. Financially, hopping from city to city and country to country might not be your best option - especially if you want to stretch your budget. Travel is cheaper the less you move around. Get a long term stay discount at a hostels, hotels and Airbnb's. Spending more time in one place, gives you the time to learn where to eat for cheap. Stay somewhere with a kitchen so you can cook your own meals and save money. Less transportation means less money spent. Bonus: You’ll really get to know a place if you allow yourself to stay longer and explore. An Au Pair is a person, usually foreign to the country, who helps with housework and childcare in exchange for room and board. There are monthly, seasonal, year long or indefinite contracts, depending on what you and the family is looking for. An Au Pair will sometimes be given an additional income along with room and board. You can save this money to continue travelling once your contract is up or use it to travel on weekends and/or holidays. Consider negotiating with the family to cover your airfare and travel insurance. Being an Au Pair isn't just for women. There are families who would love to have a “big brother” Au Pair in their family. Men, don't rule it out! Use the Au Pair job as a stepping stone to get permanent residency. Use websites that allow the family and Au Pair to browse profiles for free. Talk to the family, video with them, iron out all the wrinkles and ask any questions you have before committing. They may treat you like family or they may treat you like an employee. It’s best to determine which you would prefer and then find a family that matches what you’re looking for. Choose a good location for you. Make sure you're staying in a area you're interested in exploring on your down time. My opinion - choose the location first and then the family. Many 9-5 workers in North America only get 2 weeks vacation. If you’re willing and able to travel long term but are scared of losing your job, talk to you boss. More and more companies are allowing employees to work from home or from remote locations. Even if you can’t work, maybe there’s a month or two where you won’t be needed and can get the time off without pay. You’ll have to plan for this financially, but at least you’ll have a job to come home to. Don't just tell your boss you want to travel, tell him/her WHY you want to travel and what you hope to gain from it that will help you in your work (ie. learning Spanish in Peru will help you deal with many clients). Experience life as a farmer by living and working on a farm. There are paying and volunteer jobs. Most include room in board in exchange for your service. With the growing interest in organic foods and sustainable living, this is a great way not only to learn but to actively help save our beautiful planet. There are other seasonal jobs like carpentry, fruit picking, gardening, etc. While travelling in India, I lived and worked on a vegan farm in Auroville for three weeks. It cost me $150 for room and board. I would spend weekday mornings working on the farm and the rest of the time at my own leisure. Not only did I gain valuable experience, but I became an important part of the community and saved a lot of money doing it. Don’t sign up for a job you won’t physically be able to do - know your limits. It's tough working on a farm. Good way to break up your travels and save some money before taking off again. Protect yourself. Farm work can be dangerous. Make sure you have the proper safety equipment and know what bugs (spiders, snakes, etc.) to look out for. There are many opportunities to teach in other countries, this is especially true if you can speak and write in fluent English. You don't need a bachelor's degree to teach in some countries, only a high school diploma. However, if you do have a bachelors or more, you'll be able to make a higher salary than those with only a high school diploma. Some countries require a TESL certificate along with a post secondary education to teach in their schools. If you're a teacher just coming out of school, teaching abroad is a great way to gain experience, pay off student loans and increases your chance of finding a full time position back home. There’s a rising competition for teaching jobs and schools around the world are now being more selective with who they are choosing. If you have other skills or experience to offer, make sure to include that in your application. Teaching jobs in East Asia and the Middle East are the highest paying. There will likely be a contract involved so think it through carefully and decide if you’ll want to stay the full length of your contract. Typically, the longer you commit, the higher your salary will be. Consider the exchange rate of your country compared to the country you want to travel to. If you're from Canada, like me, a month in Europe is going to cost a lot more than a month in Thailand. If you want to stretch that budget and travel longer, choose destinations where living and travel expenses are on the lower end. Get to know currencies - your own and how it converts in other countries. Travel during low season. Low season means lower rates on flights, accommodations and activities. There are many yoga and meditation retreats around the world to look into. Some have a higher price tag, but you'll leave a month or two later with a teaching certification. Then there are places like ashrams or meditation centres that are run on a donation basis. Vipassana is one example of this. They ask for donations at the end of the course but all you have to pay for is your travel to and from the location. Courses are typically 10-days long but you can choose to extend this by spending another 10-days working as a server. While I was in India, I spent over a month in ashrams. Not only did I get a deep spiritual experience, I barely spent any money doing it. Retreats are offered all over the world, giving you many destinations to choose from. Research the teachers/instructors/guides - it’s important to like them, feel comfortable, feel safe, and be assured that they know their stuff. Look into details - language(s) spoken, on site activities, free time. Some are more laid back than others. Vipassana, for example, you can’t even talk or make eye contact or read or write or anything. Some yoga retreats however, will have social events and free time to explore the area. There are different styles/types of yoga/meditation. Do your research an choose the one your most interested in exploring. I certainly do not encourage anyone to become a "begpacker" BUT if you have artsy skills, there could be a way for you to earn money while you travel. I've met travelling hairdressers, jewellery makers, couple photographers and massage therapists throughout my adventures, mostly in hostels. If you have a skill you can offer to people, use it to your advantage and make some money as you travel. For my jewellery makers, crocheters or fashion designers: If you don't want to sell your stuff in person, start an Etsy account. As long as you have a way to mail out your stuff, Etsy makes selling easy. Collect fair trade materials from different countries to use for whatever you’re making and sell in places you get permission such as hostels or in markets. As hostels if you can advertise your services or products. There are so many different volunteer opportunities around the world in many different fields. Volunteering gives you a chance to get experience in your field, try something new, give back to communities and become an active member of the community you're staying in. NOTE: We are currently running our first Hopscotch the Globe group trip to Guatemala which will include a volunteer aspect. If you've never volunteered abroad before, I'll tell you one thing - it will change your life. You can apply to join Siya and I on the trip by clicking here. Always do your research! Unfortunately, some volunteer organizations aren’t as good as they sound. Don’t give your money away! You can usually find placements for free by showing up and then looking to volunteer or by finding an organization beforehand - don’t just type in volunteer abroad and pay for the first thing that pops up. That said, going through an organization means they cut through the red tape for you, tell you exactly what you need, help you along the way. Also, in regards to paying, don’t jump at the chance to volunteer for “free” either. Always look into everything and make sure you know what you’re signing up for and that there’s no hidden fees. Volunteering COULD lead to a job or an extended visa. It can be really really hard. You may think you’re going to be a do-gooder and help people and end every day with warm fuzzy feelings but once you see starving children, poverty, famine, AIDS, etc, you won’t feel like a superhero. Do it anyway - but be prepared that it may be one of the most impactful experiences of your life. If you can, go for a while. Long term will not only be more beneficial for the people you are helping but you’ll get more out of the experience. House and pet sitting gives you the opportunity to "baby sit" someone else's home and furry friend. Perhaps the owner is going away for work or spends half the year in another location, you'd be there to care for the house and animal(s) all while not having to pay for accommodations. Everyone wins. House and pet sitting isn’t taken advantage of enough. This is such a great option especially if you’re open and flexible with your travel plans or are able to work remotely and interested in living abroad for a longer time. Choose carefully based on time and needs of the house owener. Jobs can range from a weekend to a year or more. Best to start by asking friends and family if they know anyone who needs a house or pet sitter. This will also help to build your references. Create a killer profile on House and Pet Sitting websites. Talk about your love for animals and/or gardening. Anything that makes you a desirable house/pet sitter. Good gigs get picked up quickly so you’ll have to be on the ball. Keep checking the websites and emailing to get the job before someone else. Do a really good job - you’re being trusted with someones fur babies and all their worldly possessions. Treat it that way and lock in those good references. Figure out what you want out of the year - volunteer, explore, learn a language, etc. Figure out your finances and plan accordingly. If you’re traveling with a friend… choose wisely. Check what visas you’ll need and how long you need to apply for them. You’re never too old! Maybe you’re looking into going back to school for a career change… kick it off with a gap year! Long term travel doesn’t have to mean saving a bunch of money beforehand or living on a tight budget while you’re away. Work on a cruise ship ranges from housekeeper to chef to personal trainer to mechanic to cruise director to childcare. There are all kind of jobs for a wide range of skill sets. There are a lot of different jobs available. Shop around! You will undergo months of training before departure. You will see the world, but it's not a vacation. Crew members work every day with hours off at a time. Great for families or couples who all want to work and travel together. A great bonus of working on a cruise ship is that at the end of your contract you can get dropped off wherever you are. Plan it right so you can get dropped off in a certain location for a month then be picked back up and start your new contract onboard. You get to see quite a few places. Wake up one morning in Jamaica then the next day in Barbados and the next day in Costa Rica. Workers are usually able to get off the ship at ports. Take advantage of this time to explore. There can sometimes be over a thousand crew members so if you’re looking to date, the pool may be bigger than you think. Good luck sneaking someone into your crew cabin. Similar to working on a cruise ship, becoming a flight attendant is a great way to see the world while getting paid. You'll get to spend weekend or even weeks in new places all of the time. To find a job: search through the airlines online. Not your typical 9-5. There are crazy early mornings, long hours in the sky, and you’ll be working holidays and weekends. Make sure you are flexible. Good job for someone who is a people person - the customers can be tough. You’ll most likely need to speak another language. The more languages you speak, the better your chance at landing a job as a flight attendant in this very competitive field. If you work there for a long time, you’ll be able to be more choosey with your shifts and destinations. If you’re going to be off for a few days, you can choose to take those days off anywhere in the world if you plan it right. Know how to deal with jet lag! Tiny home living is growing in popularity and it’s no wonder why. These days, more and more people are opposed to the idea of the white picket fence and 9-5. Get a home (like an Airstream) that will move with you. This is a great idea for digital nomads or people who are able to work remotely with their current job. Ranges from living in the back of a van to having an Airstream (or something similar) to having a more permanent mobile home (a tiny home that can easily be picked up and moved to a new location). Pick the right mobile vehicle for you! Take all costs into consideration. Whether you're getting a new RV, Airstream or Tiny Home or renovating an old one, do your research on how much it's going to cost you. You can check out our Airstream renovation cost breakdown here to see how much we spent. Living in your vehicle (van) will save you money in the long run but you need to be prepare for those upfront payments for repairs and maintenance. You’re not allowed to park anywhere so make sure you’re either following the rules/laws or being really careful to not get caught. There are many free places you can park though! Invest in a tool kit. You're going to need it. A sabbatical is getting an extended leave from work to pursue a break and is typically paid. The term sabbatical is derived from the biblical Sabbath which serves an ancient human need to build periods of rest and rejuvenation into a lifetime. Anyone can take a sabbatical and travel. Even if your company doesn't have a formal sabbatical program, you can still request a one. There's no harm in asking! While some companies offer paid sabbaticals, others offer unpaid. Be sure to ask your boss about the details. Great option for people who won’t travel because they are worried about losing their job. Decide why you’re taking a break and how your job will benefit from you doing so. For example, if you're dealing with a lot of Spanish speaking clients at work and want to freshen up your language skills, this is a great incentive for asking for sabbatical. Rent your home while you’re away. That way you can make money as you travel. This might be the best decision you’ve ever made for your own health. Working until your 65 without a break isn’t healthy. Becoming a digital nomad does not mean that you are on a permanent vacation. It means your a small business owner, freelancer, entrepreneur, hustler, working all day and night (I can't tell you how many times I've pulled all nighters to get a video up or blog post out). The benefit? Having my office beach front one day and a jungle treehouse the next. You have SO MANY paths you can take to become a digital nomad. Some options include: Blogger, YouTuber, Writer, Virtual Assistant or Social Media Manager. Any business, both small or large, is most likely on social media (and if they aren't... seriously?). If you have excellent social media skills from all those hours you've spend on Instagram (yeah, I'm looking at you), reach out to businesses that interest you and see if they are looking for a social media manager to help them with their accounts. Whichever language you speak, someone out there wants to learn it. There are organizations where you can teach a language using one-on-one Skype calls and get paid by the lesson. My favourite is iTalki. You do not need to go to school or get any certification. Since the world of social media is so new, we are all kind of learning as we go. I didn't go to school for blogging, but now it's my career because I was passionate about something and dedicated to share my story, tips and advice. However, I would recommend taking an online course in an area your interested to kick start your career. If you want to travel the world and make videos for a living like me, check out my Art of Vlogging E-Course I created just for you. Don’t underestimate your skills. You’d be surprised with what you can do for freelance work. Have a certain amount of money that you budget each month you're on the road. Research different countries where that budget will last you and allow you to have an epic experience at the same time. Track your expenses to stay on top of your spending. I like to travel with a little notepad where I can write down each item I purchase, whether it's a bottle of water or a meal at a restaurant. You goal is to stay within budget, so you know how long your money can last you and ultimately how long you can travel for. If you're under budget, even better. That means you have the option of travelling longer. If you have friends and family who live in different countries, ask if you can stay with them if they haven't asked you already. It will give you a great opportunity to not just travel but live as a local in another country. Don't over stay your welcome. Contribute to grocery bills and help around the house. Return the favour and offer them to stay with you some time. If the company your work for has other locations around the world, ask to transfer. I've had friends who've worked for the same country for years, but in many different countries around the world. Even if there isn't availability right away, tell your boss that you'd like to transfer as soon as one comes up. Working at different office allows you the chance to build stronger relationships with more members of your team. This could lead to a better chance of raises or promotions. Have you travelled in any of the ways I mentioned? Share below in the comment section. Previous Post Get 10% Off Unlimited Data Worldwide with the Skyroam Solis WIFI Hotspot! What amazing tips! Thanks for the expertise. I’ll definitely look into many of these in the future. Hi Riley. I’m so glad this post was helpful for you. What type of travel stood out to you the most? Thanks for sharing it, You can do it. I just want to get up and go!